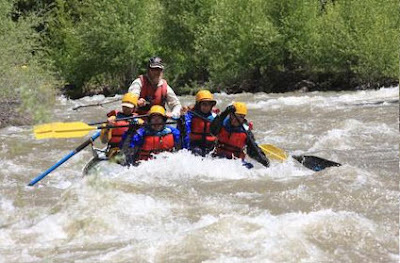 We're going white water rafting again tomorrow. This time we're starting near Placerville and hauling out near the Norwood Hill. I'm SKEERED! Read about last year's adventure here. She loved our 7 mile walk today. We're struggling to find the Tylenol. Always thought Tylenol would be a good name for a dog. Wish we'd paid more attention to Molly's name when she was a pup and came with that name. She deserves better. Dear Blogger Buddies, I discovered I've now posted 777 times!!! Does this mean I should bet $7 on horse #7 in the seventh race at Hollywood Park tomorrow? 777 just looks so signifigant. Got a lot to say for someone who does nothing! Meanwhile, back in Colorado, look who showed up today. Molly's old buddy JOHN MCCAIN! We fed him quite a few cookies which was a big mistake. I made a glorious 19 step mushroom lasagna which turned out very well but he was moaning at the glass window the whole time we were eating dinner, which made us feel guilty and over privileged. Molly ignored him. We've turned out all the lights downstairs and hope he'll head home. 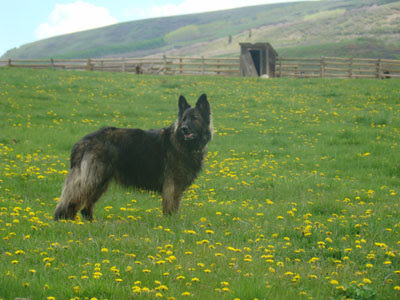 He has a very nice home and lives with several dogs and a couple of ladies. This is a grouse. Jon took all these pictures today. The next two are insect related so you've been forewarned. 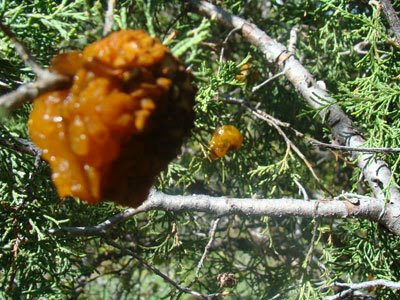 But the pictures of orange jelly fungus looked much more opaque than this . This almost looked like amber before the zillions of years descended on it to make it solid. We think it may be the pod of some insect. There seemed to be some bugs emerging in the base of one. I don't think I want to be around when they all emerge. 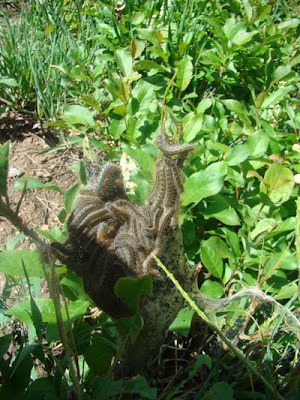 At first this looks like chicken art but look again- it's all wiggling caterpillars. ooh wee. Reporting in, your would be entymologist. We planted this tree twenty five years ago. It never got bigger, but it's still alive. When we got here the snow was pinkish as were all the windows because a red dust storm had passed through a few weeks ago, but now we've been getting a lot of rain and snow on the mountains. 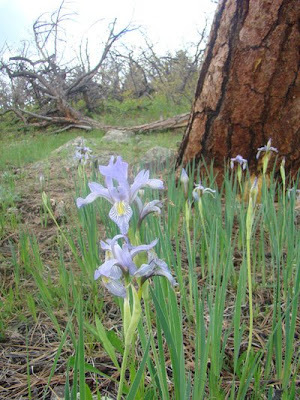 The wild iris are coming into bloom. 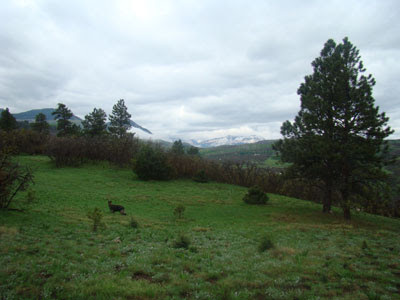 Today we saw three different elk herds on our morning hike. 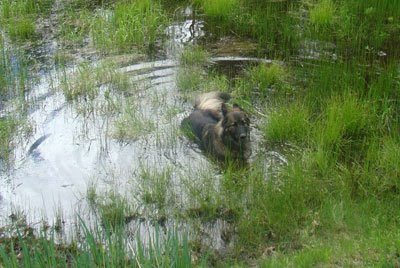 This pond is quite full right now and Molly saw an opportunity for swimming. Don't click on it, it's just a feeble screen shot. I have a hard time with screen shots on this laptop. Yesterday at the Mountain Film Festival we saw an extraordinary film, Big River Man, about an obsessive Slovokian guy who swam the Amazon River from one side of the continent to the other. A strange character to say the least, but very appealing and very overweight, he drank two bottles of wine a day sometimes while swimming. Near the end of his journey he became totally delusional, but he's back in shape again and contemplating a new project. He was on stage with his son after the screening. If you ever have a chance to see this film, I highly recommend it. The trailer for the film is embedded in Flash so I can't post it here, but you may enjoy poking around the site. I couldn't stop thinking about it last night and today. On the way down our road into town to see a Ken Burns documentary on the National parks, Part 4, a bobcat strolled in front of the car. Highlight of the day. 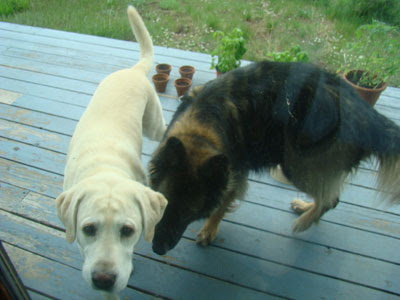 I reached for the camera but by that time Molly had started her barking and the bobcat took off. I get pretty restless with Ken Burns, in fact wondered afterwards why I said I'd go see that one. The slow zooms in and out on still photos, the ponderous voice of Peter Coyote, the period appropriate but spiritless music. whew I was glad when that ended. We're going to see a film about a man who swam up the Amazon this afternoon, a feature of the Telluride Mountain Film Festival, not to be confused with the celebrity lovin' Telluride Film Festival which takes place at the end of summer. A new neighbor is in town for the festival. To our great surprise and unhappy shock she's going to be building a house on adjacent land. She's a single woman from Marin County, about forty. Yesterday she was at a high minded symposium on food and climate change and leaving a small footprint on the planet. She was very inspired by all the speakers. 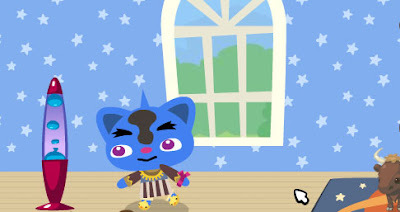 So I figured she'd be building some kind of yert with those pretty paper prayer flags you see all around Ridgway, but instead she has plans for a two story 3 bedroom house with a separate two car garage. One person. 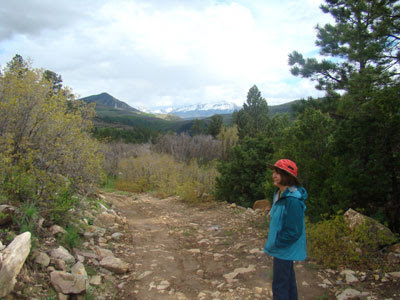 She wanted to get an easement across our land for utilities but we explained why we wouldn't do that. 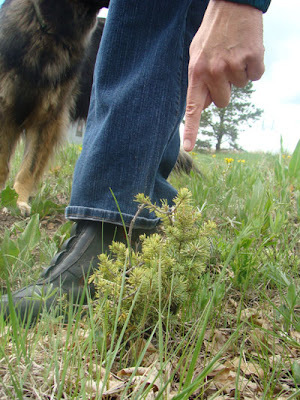 We've let people do this in the past and the land is too fragile-- it stays scarred-- the footprint never goes away we explained. We walked to the specific spot where she wanted to lay the line, and, what's this? 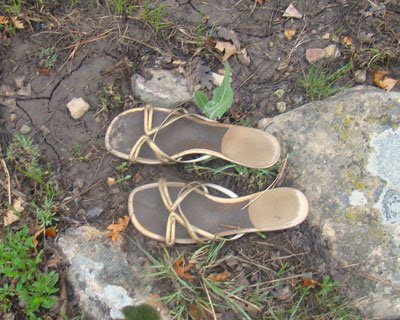 These golden slippers were stuck in the ground as if the person has just ascended. Oh dem golden slippers. They had little hourglass heels that were stuck in the mud. It was totally bizarre. When I went back to take a picture today I decided I rather liked them and they seemed to be my size so I took them home. 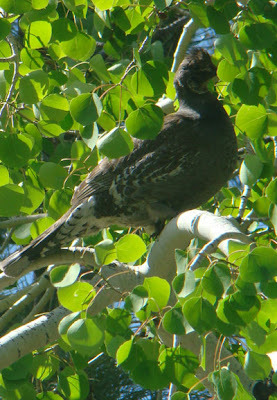 Their location in the bigger picture was near the second largest pine tree. A most amazing video, and Trigger even does some fancy dressage moves. For a while Roy Rogers had a big museum in a warehouse out in Victorville, Ca, in the desert. It was a wacky place and honestly didn't make you like him better. But this video is Roy at his very best. 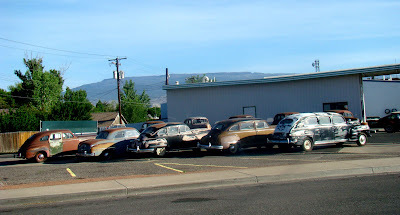 We thought these were movie cars as we drove through town but they're at a specialty used car lot. Colorado has a lot of time warp towns-- Utah even more. I played with cars a lot when I was little because my father loved the Packards of the 1930s and we went to many car meets. I know all sorts of things about cars from the 30's that would stop any conversation cold. We saw these gorgeous elk climbing a hill at Woods Lake today. 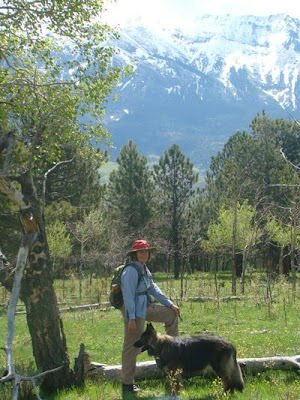 It's a favorite hike for us, but we'd never seen elk there before. The beaver had been busy (it's true, they are) and had done some damming work that flooded the usual trails. Afterwards we stopped by the Sheriff's office to get hiking passes. With the pass, even if you fall down and require airlift, it doesn't cost anything. Jon fell in the mud today. We hadn't been to the Sheriff's office before. The office was sort of sanitized and unfriendly. I thought it was queer that they had glossy glamour shots framed on the walls of two women who were murdered in the Telluride area during the last 20 years. One was a famous case, the Uhaul heiress. We said to the gal at the desk, "This is our first time here." She said, "Be glad you're coming through the front door!" We took a side trip to see Main Street in Salina, Utah, which we hadn't driven down in about twenty years. 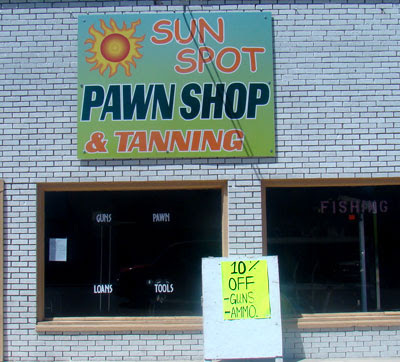 Across from Mom's famous cafe was this sad store: tanning, pawn shop and guns and ammo 10% off. Looks as if you might be able to pick up fish eggs in there too. wow they have wi fi at this Super 8 motel even though the town is a super sad overlooked old Mormon town with ties to John Wesley Powell's river exploration. Easy trip listening to cds of Bob Dylan's Theme Time radio shows. Coming down a steep hill into Green River we passed 3 oversize load trucks coming up the hill, and each one had what looked like a brand new gigantic jet wing. Huh? Wish I'd gotten a picture. And why three? Off to dinner at Ray's Tavern, a spot log popular with old time river rafters. We're leaving before dawn to drive to Colorado in one day. Just finished frying the chicken and the car is packed. Talk to you next from the mountains. I was surprised and happy to see this video of my favorite racehorse The Pamplemousse noisily enjoying an apple at Hollywood Park just last week. Youtuber johnchen provided the video. The P was scratched the morning of the Santa Anita Derby and hasn't been heard from since. Last night I got sent a nice link to an interview with my old pals Bob Armstrong and Allan Dodge talking about their music over the years at Fretboard Journal. About 45 minutes in they talk about working with me. I was trying to find a picture of us this morning but came up empty. Al's all mixed up about the Academy Award stuff but it was great to hear their voices and brought back so many memories. The Preakness is today, and it would be great if filly Rachel Alexandra won but there are a lot of great horses in there. 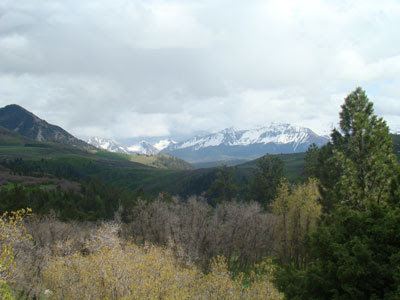 Packing up and heading out Sunday morning for an extended stay in Colorado. Two months? Six months? Don't know. Makes it hard deciding what to pack. The secret is, though, that you need so much less than you ever imagined. Leave the Lava Lamp behind, babe. But the stuffed yak and the ducky slippers maybe should go. 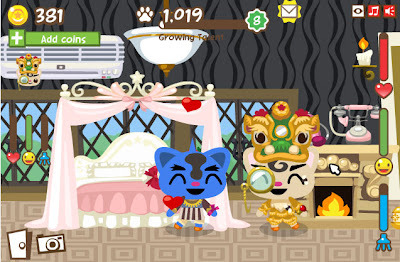 Facebook has an app called "Pet Society" that is a Flash marvel. I am so enchanted with this game, maybe all the more so because I can't even start to imagine all the wondrous code coming together to make it work so smoothly. I used to talk about terrible show horse names and had chosen "Toxic Dump" as one that you wouldn't be too likely to encounter. And into the ring comes Sally Cruikshank riding Toxic Dump. So I picked that as the name of my little character on the left. Now I'm stuck with it. Blog pals Namowal and Russell... are also in my neighborhood and I hope you'll join too. We dance, hug, kiss, tell jokes, and earn coins. The friend I'm with here I picked up in the cafe. Incredible time waster but so sweet. Dinah posted a whole set of wonderful pictures of her schooling Tia on the grounds where her show will be this weekend. She's riding on the U.C. Davis eventing team. Look at Tia jumping into the water! Amazing! 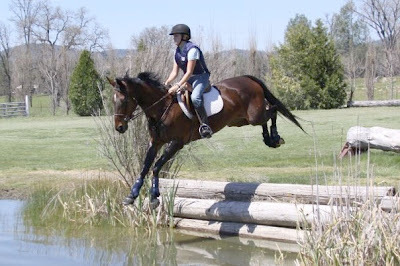 This is a horse that was afraid to cross a tiny stream when she lived at Bell Canyon. I'm so proud of Dinah and her trainer, and of course Tia to become such a big brave horse. You can see more of the pictures here. (Not sure if the link will work if you aren't a Facebook member.) The other two girls are going to be her roommates next year. Remember the pictures from Fresno last year? I saw a possum playin possum today and it fooled me. It fooled Molly too. It was early in the morning at Lake Balboa. It was lying still on the ground, eyes open. It looked as if it had just been killed because its fur looked so fresh with dew from the grass on it, and its paws so pretty with the long nails . Since we'd had a coyote encounter yesterday I just thought it was coyote breakfast, but wondered since it had no marks on it at all. What's the story here I wondered. When I got home I realized I'd been fooled by that little opossum. The one in the puzzle above was in our back yard a few years ago. Many people find opossums disturbing but I like their prehistoric oddness. By the way, I learned a little more about Flash and iphones this week and thought I'd pass it on. "Adobe's supposedly working on it, but it's a challenge to do and do well. And Apple doesn't seem particularly anxious to see Flash on its phone..."
"The thing about the iPhone is that it can't do flash. Why? I don't know. They didn't work that out with Adobe somehow. Anything flash needs to be rebuilt in objective-c. That said, I'm sure you'd be a whiz at objective-c! You can actually download the developer's kit for free from developer.apple.com, and play... if you want to put something up for review / sale you'd have to pay the $99 developer fee." Forget Swine- the new BAD is Pine! When I was in Florida I was troubled by a persistent bitter taste in my mouth, stronger than anything I could eat. It worried me enough to google it on the computer in the exercise room. I decided it must be psychological, you know, a bitter thing to swallow being there for the memorial service. Dr. Sally at your service. Then two days ago it started again. Creepy. 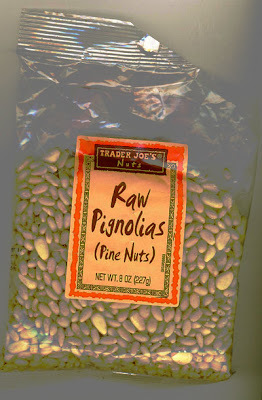 This time when I googled it I discovered there are hundreds of people going through the same thing this month, and they say it's caused by Trader Joe's pine nuts. According to the posts I've been reading, it strikes about 24 hours after eating pine nuts, and can last a day to several weeks! Not everyone who eats the nuts gets the bitter bad, and it has no other related symptom. We had pesto two nights ago. Official name for pine-nuts-make-everything-I-eat-taste-bitter-for-weeks: Pine Flu. Feel free to panic. Bloggers everywhere are getting it! The pine nuts on Flat Belly Diet make everything else I eat taste bitter and metallic. Didn't know this was a side effect of pine nuts! The bitter metallic taste that i've had for the last 3 days apparently is caused by the ridiculous amount of pine nuts I ingested. On and on like that. It's even in wikipedia now. They aren't even from China! They're "product of Korea, Russia or Vietnam." I enjoyed this one. You may have seen it, I imagine it's one of those wildly shared videos. Click on the goofy white symbols. It's just an experiment from a long time ago, but kind of fun to zoom around with. If your computer screen is small it may look better bigger here. What do you think? I got this idea in the middle of the night last night and couldn't wait to try coding it. Let me know if you have ideas for improvement. 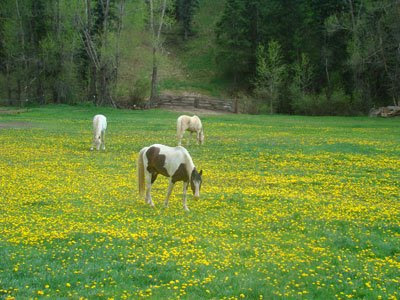 The horses she's mentioning are really running and I'm not the one who chooses them, they're Whinsey's idea. Tell me if the font on top matches the one in the racing tip. I'm not finished with this, just testing to see if it seems to work. You can't chat with her-- just get your racing tip and check back tomorrow to see if she was right or not. Think this might be one of those iphone ideas? But they still don't do Flash, do they? If only I'd followed the advice of the crazy lady I ran into at Hollywood Park, last December, I would have made more than $2000 on the Derby even though I'd never thought twice about Mine That Bird. She said, pick a horse you really think is going to win, bet him in an exacta with all the others as possible for place position, or coming in second. Then make a second bet with all the others to win and your horse to come in second. This bet would have cost about $80! and if the two horses that came in first and second had low odds you wouldn't even have won your bet money back. But in this case, vavavoom. Pioneerof the Nile was an obvious choice to bet to win once I Want Revenge was out. Garrett Gomez writes a terrific move by move blog about his ride on the horse here. I even had a bet on him to win, but more on Chocolate Candy and Mr. Hot Stuff. Our whole family watched the Derby on a big screen tv at the senior center a few hours after my father-in-law's memorial service . Drinks were complimentary and there was quite a crowd of old timers in the hall. Some of the elder gals wore big hats, and they had a form of gambling set up where you paid two dollars to draw a name from a hat. Winners got $20. The jockey, Calvin Borel, is pretty amazing-- surprised there weren't more bets on the horse just based on the jockey choosing to ride him, though it was a late choice after Square Eddie was scratched. The day before Calvin Borel had won The Oaks race on a filly named Rachel Alexandra who's thought to be more talented than any of the horses in the Derby. Borel thinks she's the best horse he's ever ridden. She won her race by 20+ lengths!! I Want Revenge's injury is more serious than was first thought, so it was very wise they chose not to run him-- he could have broken down during the race. Poor guy. I was heartbroken when I heard he wasn't running in the Derby. My father in law's memorial service. The service itself was really great and Bill would have been proud. A big crowd showed up to honor him, (amazing considering he was 94), and many people spoke and said such nice things, remembering how he could whistle, how he loved martinis and golf, and what a great father and gentleman he was. Relatives, relatives, all kinds of relatives! From Chicago, from New Jersey, from Boston, even Dinah from Sacramento flying in on a red eye. Meals, meals meals all eaten in nice restaurants, with widely different points of view coming from: a stock broker, a tanaholic, an ADHD life trainer, students, an asbestos lawyer, a neurologist, a math teacher, and a really big baby. First time I'd heard that Obama was "a total disaster" or that "there should be no taxes on anything." Weirdest opinion was on our flight to Florida. A very tall and attractive young guy sat between Jon and me, in the seat we'd hoped wouldn't be taken. He was looking at video footage of a secret surfing spot in Mexico on his white Mac laptop, for hours. He was friendly and had a good sense of humor. But talking about Mexico and the crime there, he said, "Tijuana's dead, Rosarita's dead, we should just move in and take over the country." EEK! First time I heard anyone say we should invade MEXICO! Well it would deal with the immigration problem, because then everyone would be legal! whew it was weird at the airport yesterday. On our first flight a woman was groaning and grabbing the wall at the front of the plane, (I think it was terminal cancer), and when we exited the plane she was lying on the floor in front of her seat. And a hip looking trim mid 20s guy collapsed in the cabin mid flight and they called on the loudspeaker for doctors or emts. There was an emt on board, and we didn't have to make a surprise landing. The guy was able to walk off and was met by medical personnel. Then in Chicago I saw a mom? and daughter's bf? drop a pretty blonde college student in a chair. "Aren't we going to stay with her?" "No, we're going to walk around." She looked awful and fell asleep after wiping her nose a bunch of times. Weird thing was they never came back for her in the hour we sat (far enough away) from her. 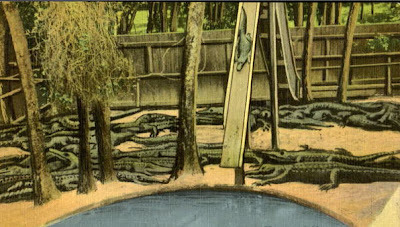 I'm sure I'm over reacting because of emotional situation here in Florida, but it was creepy.